Friday - Pizza with both Leftover Soup and Tofu nuggets! You will see that we did quite well with leftovers last week. Leftovers help me retain some sanity in a busy week. While the sun shone, we suffered a week of Sylvia having a nasty cold. She wasn't eating well so I made tofu nuggets for her on Wednesday. She usually loves them, but barely touched them last week. For myself I made a sweet potato and red lentil soup. It was a recreation of an old favourite recipe that I have lost. As well as being dinner one night, it provided many lunches - I even still have a few tubs of it in the freezer - and then was part of our pizza on Friday. I mixed some soup with tomato paste to spread on the base. The topping was chopped tofu nuggets, mushrooms, green capsicum, cheese and smoked paprika. I used bases from The Colour of Earth. The pizza was substantial but might have benefited from the sweetness of pineapple to counter the intense flavours. We haven't had a lot of desserts lately but after the pizza we had a crumble with custard. It wasn't quite what I had planned. This had started life on the Saturday as Apple Pumpkin Crumble Slice from Diet Dessert and Dogs. It was intended as a gluten free vegan dish to take to a potluck at Cindy and Michael's place. It all went a bit pete tong. I substituted brown rice flakes for oats. Maybe this was the reason that the crumble mixture seemed just far too wet. It was a shame, given that the apple pumpkin filling was lovely. I was poorly on Sunday afternoon and spent it in bed rather than sharing my slice at the potluck. I was a little relieved not to have to take my slice along. It wasn't great. Too damp and dense. Instead we put some in the freezer and some in the fridge. So far I have only had one serve warmed in the oven and drowned in custard. It was good but I loved the filling so much that I think this slice deserves a second chance, maybe with oats as Ricki intended! Which is the reason that I have recorded what I did below. I have had a few failures from Ricki's recipes. It struck me that I have had a few disasters from some of my favourite bloggers. It seems a terrible thing to confess. Yet I have also had heavenly dishes from these bloggers too. That is the nature of being inspired by cooks who push my boundaries with new ingredients, diets and methods. (Especially when I am gung-ho about changing the ingredients according to what I have, which doesn't always work.) The upside is that when it works it is brilliant. As demonstrated by my subsequent success with Ricki's Coconut Brittle. These above pictures are of the before and after version of cacao nibs and chia seeds. Exotic ingredients that now grace my pantry, thanks to blogging inspiration. They went into the coconut brittle. As soon as I saw the recipe I wanted to try it because the ingredients interested me so much. Then I decided to try it one night and discovered it needed 2 hours in a very slow oven. It had to wait until I had time during the day. I made it last week when my friend Kathleen came for lunch. Sylvia and I got the mixture together before Kathleen arrived and it cooked while we ate and chatted. I made us salad sandwiches with grilled and sliced leftover tofu nuggets. (Sandwich filling: tofu nuggets, mashed sweet potato, baby spinach, grated carrot, sliced tomato and vegan mayo on my olive oil bread, made with chia seeds, wholemeal and rye). They were great. For afters, we had chopped apple and a nibble of the coconut brittle when it came out of the oven. I loved the coconut brittle. It was barely sweet, tasted slightly of fruit from the apple sauce but mostly tasted of coconut and sesame, two textures and flavours that I love. I was surprised that it tasted a bit sweeter before baking than after. Ricki says that it is great for travel. I loved taking it to work for lunches. The last thing to say about last week is that I finally got my Skype account on my computer up and running with my first video call to my sister Fran. I have used it at work where we regularly meet with remote colleagues by Skype. Using it at home seems quite an achievement for me - a Luddite at heart - in coming to terms with all the new technologies of our world. This time four years ago: Ruby Crumble of rhubarb and raspberries! Grind cacao nibs and chia seeds in a coffee grinder or blender (I used an attachment for my hand held blender). Place ground cacoa nibs and chia seeds in food processor with remaining ingredients and blend. I found that I needed to stir mine at the end because the food processor was struggling a bit. Spread paste into a lined lamington tin (13 x 9 inch). Cook at 120 C (I put mine on fan forced so it was slightly warmer) for about 1 hour or until dry and starting to brown. Cut into four and use an egg flip or spatula to flip over. Cook another 30-60 minutes, keeping an eye on it for when it gets golden brown. Cook and break into chunks. Keep in an airtight container for at least a week (but don't store with cupcakes or it will soften). Bake sweet potatoes whole in their skin for about an hour or until they feel mostly cooked (if not quite cooked, they will cook in the soup). I think I did this while cooking the coconut brittle in a low oven but the temperature doesn't matter too much - just keep an eye on them every now and again so they don't burn. Fry onion, celery and carrot in olive oil in a large stockpot for about 15 minutes until vegetables have softened. While vegetables cook, peel and chop sweet potatoes (mine had cooled which is optional but makes peeling them far easier). Add remaining ingredients and check seasoning. Bring to the boil and simmer for about 15 minutes or until lentils are cooked. Blend. Check seasoning (the soup gets sweeter when blended due to the sweet potatoes). Serve hot. Can be frozen. Preheat oven to 180 C (350 F). Greased and line a 22cm (9 inch) square cake tin. Mix together the melted coconut oil, maple syrup, coconut sugar, linseeds, soymilk and lemon zest in a large bowl. Set aside. Pulverise walnuts, almonds, oats and coconut flour in food processor until mixture resembles course breadcrumbs. Add cinnamon, ginger and salt and blend until just mixed. Add the dry ingredients to the wet mixture in the bowl and toss with a fork until it comes together in a "very moist yet crumbly dough". (This is where I had problems - mine was very moist, even very wet, but didn't crumble at all - maybe I should have followed Ricki's instruction and used a fork instead of a spoon but it also looked a lot darker than hers.) Set aside while you prepare the filling. To make the filling, mix together the pumpkin, apple, lemon juice, rice syrup and chia seeds (if using). Press about half the crumble in the prepared tin. Spread filling across the crumble and then sprinkle the rest of the crumble on the filling. Gently press down the crumble topping. Bake in preheated oven for 30-40 minutes or until browned. Serve warm with custard or cool in tin and cut into 8 or 9 large squares. May be frozen. Spring is on the way! The sun has been shining with great promise for the last week or so. We have been spoilt with two sunny weekends in a row. Last weekend I was so optimistic. E hung the washing outside. Sylvia blew bubbles for Zinc to chase about the yard. I weeded the garden and started making lemon barley water. Then we went to CERES cafe which was understandably busy but the service left a lot to be desired. Not its finest hour. The same might be said of the lemon barley water. I have been thinking about Lucy's recipe for some time. It has occurred to me at many times this winter while I have wondered about what to do with all the meyer lemons produced by our little tree. The sunshine last weekend seemed right for a refreshing cool drink. My mum had told me I need to pick the lemons. I don't eat so many lemons in winter. But it seemed they wouldn't wait for summer. So I put on the barley to soak. I rubbed the sugar in the lemon rinds. Lucy says that this is satisfying work. I agree. It left my fingers with a wonderful lemon scent. I love lemon zest more than lemon juice. It has a pleasingly intense fragrance. The juice is just too tart for my liking. So you see, I am not the biggest lemon fan. Lemons are usually (and often) a bit player in my recipes, rarely the star. Making lemon drink was a risk. Blame the lemons. They looked so gorgeous. Our own harvest seemed too special to fritter away with a tablespoon here and there. I have enjoyed lemon barley water in the past. The very idea of it attracted me. It reminds me of sitting watching the tennis on the telly in summer with Ken Rosewell advertising barley water. When our visit to CERES was such a disappointment, I was looking forward to coming home to a nice glass of lemonade. I love my fizzy drinks so I had decided to make it more concentrated and add soda water. We sat in the sun on the verandah and tasted it. The drink was nice but it wasn't very sweet and tasted far too much of lemon for my tastes. So I bought some frozen raspberries to add with a bit of honey. After gritting my teeth as I sieved the raspberries into the lemon mixture, I finished making my drink not mid afternoon but after dinner! The drink still tasted quite lemony but with added sweetness and fruitiness. It hasn't been a huge hit but Sylvia and I have enjoyed a glass from time to time during the week. Sylvia had a cold last week and wasn't eating much so I figured that she could do worse than have the lemon, honey and extra energy in the drink. This is definitely a drink for summer. Maybe if our lemon tree gives us fruit in the warmer weather I will have another go at a pink lemonade. I am not so sure about the honey, which I found had a strong flavour but I think that raspberry and lemon (or lime) is a great flavour combination. With some ice blocks and a sprig or two or mint, this would be a fine cooling drink on a hot day. While barley is simmering, peel lemon peel off lemon using a vegetable peeler. Mix peel and sugar in a heatproof bowl. Use your hands to rub sugar into peel to release the oils. When barley has finished simmering, pour barley and hot water over lemon peels and sugar. Leave to cool. I then gently heated raspberries and honey in a small saucepan but next time I would try just adding raspberries and honey to barley and water to soften them. Sieve raspberry and lemon mixture together. Keep concentrate in the fridge and serve with soda water and ice cubes, to taste. The first time I went to make these beetroot brownies last week I only had two eggs in the fridge and one was for Sylvia's boiled egg in the morning. The other egg went into an apple and date cake that then accompanied E into work to a meeting where it was gobbled up. We bought more eggs and I made the beetroot brownies. Finally! They were worth waiting over three years to make. The recipe came from Karen Martini in the Sunday Age in 2008. I meant to keep the page with the recipe. I lost it. Fortunately Cindy and Michael posted it. I never forgot it. I just took a while to get there. Good intentions and all that! After unsuccessfully fiddling with Kari's brownies, I stuck to the recipe. It was fantastic: fudgy and pink! I loved it. So did my mum. Sylvia took an occasional bite. E thought it was too beetrooty. I sort of know what he means. They weren't rich, chocolate or gooey but I loved the dense texture that comes from combining vegetable, nuts and chocolate. It felt a little more healthier than the average brownie but very pleasing nevertheless. I am sending this to Rinku of Cooking in Westchester for Weekend Herb Blogging #298, the event coordinated by Haalo and founded by Kalyn. from Karen Martini via Where's the Beef? Preheat the oven to 180 degrees C. Grease and line a 20cm square cake tin with baking paper. Cream together the butter and sugar. Mix in the vanilla, nutmeg and flour. Beat in the eggs one at a time until well combined. Fold in melted chocolate (at room temperature), ground almonds and grated beetroot. Spoon the brownie mixture into the prepared cake tin and bake for 25-30 minutes or until a skewer inserted in the middle comes out cleanly. Optional: Once the brownie has cooled, drizzle the melted chocolate over the top before slicing and serving. Ours lasted almost a week - the top went a bit soft but the cake remained moist and fudgy. I have sorely neglected Nigel Slater's Tender. I loved his Kitchen Diaries and Toast but life got very busy at the moment I was given Tender Vol I. Enter some inspiration from the Cookbook Challenge, which has a different theme each fortnight. I joined the challenge because I needed to spend some time with my cookbooks rather than being lazy and searching the internet. It is working. This fortnight, with the theme being soup, I decided it must come from Tender. Finally I have broken my duck (to use a cricketing term)! The soup I found was called Leek, Roots and Walnut Soup. In this instance "root" meant jerusalem artichokes. I thought this was perfect because Jerusalem artichokes are a winter vegetable. It are not a vegetable I use very often but I was up for the challenge. However, they were not about in the supermarket and I didn't have time to search them out in other places. Instead I just collected a jumble of other root vegetables, assuming any root would do! The vegetables were green and nice but nothing special. They made a very tasty green soup without the spice topping but I would be bored eating the same soup every night. However what interested me about this recipe was the idea of an ordinary mix of vegetables with an interesting spice topping. It gave me visions of a cookbook with just one vegetable soup (well maybe one for each season) and many many versions of spice mixes. Could I eat the same soup over and over if I added different spice mixes each night? Unfortunately it was the spice mix that wasn't quite to my liking. It was fragrant, tasty, interesting, but just a bit chunky for me. I would definitely make this soup again and would love to try it with Jerusalem artichokes if I find some. Next time I would chop the walnuts finely and just use ginger juice, as I have written below in the recipe. Yet again, I find inspiration in the Cookbook Challenge, as well as renewed appreciation for one of my cookbooks. It has led me to the introduction of Tender that I merely flicked through when I first got it. I must read it properly. As an aside, I have just finished reading Eat Pray Love by Elizabeth Gilbert which was far better than I expected - a really interesting read if you don't mind a lot of navel gazing. My current book is annoying me with comments such as the one about a brand of designer jeans that apparently everyone either has a pair of or wants a pair of. I am not familiar with the brand and have no interest in it. Maybe my precious reading time would be better spent with Nigel Slater! To see what else my fellow Cookbook Challengers have made, go here. Wash and roughly chop leeks. Heat oil in a stockpot and fry leeks and celery until softened - about 10-20 minutes. Meanwhile peel and roughly chop the other vegetables. Add to saucepan and sweat for about 5-10 minutes. Add water, stock and salt. Check seasoning. Bring to boil and simmer for about 30 minutes. Add parsley. Blend with hand held blender. Serve topped with spice mix. Spice mix: make this while soup is simmering. Grind coriander seeds with a pestle and mortar. Nigel then bashed about his walnuts in the same mortar and pestle but I would just finely chop them next time. He then cut ginger into matchsticks and fried with the coriander and walnuts in the oil for just a few minutes. I think next time I would finely grate the ginger and squeeze out the ginger juice, leave out the oil, dry fry the walnuts and coriander briefly and add these along with the ginger juice to the blended soup. One good recipe leads to another. I had a bit of time with Sylvia before dinner last week so we made chickpea crackers. They were great. Then I sat feeling blank about what to make for dinner. I had little energy and a few vegetables in the fridge to use up. The chickpea crackers from Lisa's Bike Bake Blog was so simple and delicious that I had a look at her index and immediately found a sweet potato stew that grabbed my attention. I got into trouble at first by following the recipe too literally. The above sticky blob of dough just didn't look like it would roll out. Yet I was foolish enough to try rolling it between two pieces of baking paper. Then I came to my senses, scrapped it off the paper and returned it to the bowl where I added more besan (chickpea flour) until it looked like the sort of dough that would roll out (see below). Once the dough was the right consistency, the dough was easy to manipulate. I used different spices because I didn't have any fresh thyme on hand. I also didn't read the recipe and broke the dough into individual crackers before baking rather than after. I don't think this made too much difference. The resulting crackers were very moreish. The tastiness of chickpea flour works well alongside the spices. The texture was more crispy-even-slightly-chewy-dough than buttery-melt-in-the-mouth. Not surprising with crackers containing only a little olive oil. 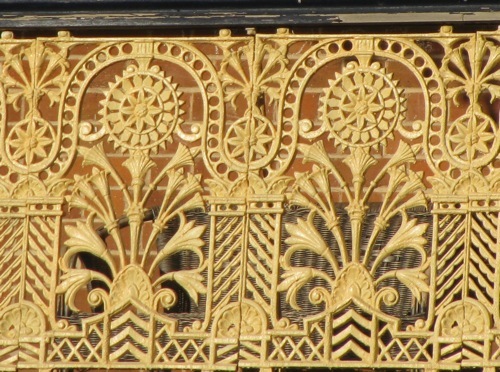 It is a texture that I quite enjoy. Not only does it taste good but it holds together well. Which is important when dipping in beetroot dip (or pink hummus as Sylvia calls it). Sylvia loved them. We all did. I am always delighted when Sylvia loves any of my recipes but last week she excelled herself. Actually I decided to make these biscuits because she suddenly was enjoying hummus dip. She also tried yoghurt with blueberries, hokkien noodles in mee goreng sauce, mushrooms on pizza, and a teensy weensy piece of toast with almond butter. I don't mean she is eating all these things often - she is already turning up her nose at the yoghurt and preferring pink hummus to regular but it gives me hope. However I knew that the sweet potato stew would be too much of challenge for Sylvia's plain tastes. It suited E and myself very well. It solved the problem of what to do with my sweet potato but my eyes were playing tricks on me. I mistook the white sweet potato for tofu and started wanting to eat tofu in a stew. So I used it instead of beans. The spices were so unusual that when I ate leftovers for lunch the next day a colleague came in to ask what was in it. "Coconut milk, ginger, mustard, nutmeg," I guessed until she said a-ha at nutmeg. Unusual but very very nice. Roll out thinly between two sheets of baking paper I had to keep checking mine wasn't sticking and even sprinkled a bit of extra besan on the dough as I rolled it out. Remove top layer of baking paper and cut into desired shapes with a pizza cutter or pastry wheel. Prick each cracker with a fork. (I broke mine into pieces at this stage but it was fiddly to do so I would prefer to leave as a whole piece of rolled dough with lines in it next time.) Bake for 16 minutes or until golden brown. Cool on a wire rack. and then break into pieces. Update: remade these and got temp wrong - cooked at 155 for 11 minutes and then 175 for 10 and they were crisper than the first time. Heat oil in stockpot over medium heat. Fry onion for a few minutes until translucent. Add ginger and spices and stir constantly for about 1 minute. Toss sweet potato in spices. Add water, milk, stock powder, pumpkin and tofu. Check seasoning. Bring to the boil and simmer for about 30 minutes. Add broccoli and simmer uncovered for 5-10 minutes until broccoli is tender and sauce has thickened. Serve with rice or noodles. When I saw the theme for the Cookbook Challenge was European a few weeks back (yes I am behind in my challenges), one recipe planted itself in my mind and refused to leave until it was made. It is an old favourite that I have made a few times before. I know it is a tricky one to make but fortunately I also know it is worth the effort to make Mollie Katzen's pumpkinickel rolls with raisins from Still Life with Menu. Last weekend I finally had the rye flour and the time needed to make them. I decided they would go nicely with a pot of split pea soup. Fortunately I started early in the day as these took me 7 hours to make, plus a lot of hard work. It took me a while to find rye flour, but I was more relaxed about the other ingredients which I usually have on hand. Hence on the day of baking, I found that I was really low on yeast and found a packet that was a year out of date. I also ran our of molasses and used treacle. One change that I have always made is to use currants rather than raisins. Sylvia wanted to help. and stirred (sloshed) while the going was easy but E helped distract her while I kneaded in the flour. This is dough that is so stiff my wrist was hurting. It is very different to my usual soft malleable olive oil dough. In fact it is not at all pleasurable. As I kneaded I thought about dough hooks and how pumpernickel bread was around long before anyone had considered them. So why make a dough that is so stiff it hurts? Maybe Mollie Katzen was using our light fluffy flours to imitate bread made by peasants who could only access hard recalcitrant flours. Ah, you see, I had too much time to think as I kneaded. The resulting rolls were excellent. They were surprisingly soft, despite being very dense. The texture was far more towards the cake end of the spectrum than most breads. Best of all, the flavours were amazing. This is why I keep returning to the recipe. I first made the rolls to serve with a celery and stilton soup (I think). Despite being slightly sweet (or too sweet if you are my mum) they have a bitter edge that makes them perfect for adding a bit of interest to a pot of soup. Sylvia seemed to like the pumpkin rolls when I made them last weekend. She ate one in the car on the way to an indoor play centre where we met my friend Jane and kids. She also had one with her evening meal. Then the next day she wasn't interested in them. E wasn't so interested in them. So I frozen most of them and had them with leftover soup for lunch during the week. Now that is a fancy lunch! They are so flavourful that I found they were great on their own for breakfast. I highly recommend these if you want to impress or are looking for some bread that is very different to your fluffy white loaf. However only make them if you have time and a bit of energy. I am sending these to YeastSpotting, Susan's lovely weekly yeasty round up. You can see what my fellow cookbook challengers got up to here. Melt choc chips and butter and let cool to room temperature. Place lukewarm water, and yeast in a large bowl and let 5 minutes until it starts to frotth (my yeast was quite old but there was something happening - not so much frothing but more like the yeast film on the water separating to reveal a murky underneath with a little swirling - after 5 minutes so I went ahead with it). Stir in molasses, raisins (or currants), wattleseed and salt. Drizzle in chocolate. Mix well. Stir in 2 cups rye flour and 1 cup of white flour. It should be just stiff enough to knead if you have lots of flour - though it reminded me more of cake batter than bread dough. Mine was so sticky it needed a lot of flour to be able to handle it - it would probably work better in a stand mixer with a dough hook if you have one. Mollie says to knead in the rest of the white flour and as much of the wholemeal flour as you can. I could only manage about half a cup of the wholemeal flour. It took me over half an hour to mix in that much of the white and wholemeal flour and by then I was tired of kneading recalcitrant dough. Once as much flour as possible is incorporated knead for 10 minutes (if you have any strength left in your arms - this isn't easy soft yielding dough - it resists every pummel). It should be smooth and not sticky. Place dough in bowl, cover with a dry clean tea towel and let rise in a warm place for about 3 hours or more (I left mine for 4). The dough will only rise by about 3/4. Cut dough into 16 pieces and roll each piece into a ball. Sprinkle a large baking tray with cornmeal and place rolls on it at least 3 inches apart. Cover and leave to rise for about 45 minutes. On the weekend I bought split peas at the Vic Market and I thought of Hannah from Wayfaring Chocolate. This was where I first met her and I was buying the split peas to make a soup that she had recently posted. I was also accompanied by a colleague who told me that leeks made split pea soup really smooth. So I bought some. I added lots of vegetables and it was fantastic. Potage St Germain sounds like a fancy soup but it was easy to make while Sylvia and E blew bubbles in the backyard. Just as well because I had spent the afternoon making pumpernickel rolls which were hard work. They tasted wonderful with the soup and I will post about them soon. I let my vegies cook a bit long and used some dark home made stock. So I was pleasantly surprised that my soup was still quite green. Hannah made the soup to look after her family during an illness. I heartily agree with her that this soup has restorative powers. Last week had its fair share of moments when I needed some cheer. I dropped my fancy new water bottle of two weeks and broke it. Being awake in the cold at 5am with a crying baby. My mum and dad's old family dog was put down. Nothing like a hot bowl of soup to bring a little comfort. Thanks Hannah! I am sending this to Preeti of W'Rite Food for My Legume Love Affair #38, the legume event founded by Susan of The Well Seasoned Cook. Soak split peas in the water in a large bowl for at least 3 hours - overnight is fine. Roughly chop vegetables. Heat oil in stockpot and fry onion, leeks, parsnip, potato, celery and garlic, stirring frequently, until vegetables are softened. About 5 to 10 minutes over low heat (I did mine a bit long as I got distracted and they stuck to the bottom of the saucepan). Add undrained split peas and stock. Check seasoning - it should be very well seasoned because once the frozen peas go in they will sweeten it slightly. Bring to a boil, simmer uncovered, about 1 hour or until split peas are tender (skimming the surface and stirring occasionally). Stir in frozen peas and gently simmer for about 10 minutes or until peas are tender. Check seasoning. A good grind of fresh black pepper is just the thing to finish off the soup. Blend (and sieve if you want it ultra-smooth but I didn't and nor did Hannah). Serve hot. It has been a little bit Orange around here lately. I can assure you that there I have been cooking up a storm since getting back from holidays. Some has been great. Not all. I thought today that I would reflect on a week of meals and leave you with my version of my favourite meals last week - Yogi Kitchen's besan fritatta. I am not sure I would claim this is a typical week. We don't usually have so much of my mum's stews - though when we visit she often sends us away with leftovers. Bangers and mash are our regular Monday meal that E makes. I do try and have leftovers for busy days. I also made other dishes that I will post about later - the potstickers (also inspired by Yogi Kitchen) and olive oil bread with chia seeds. Breakfasts starred a lot of berry yoghurt with Carmen's gf deluxe fruit muesli and toast. Lunches were lots of sandwiches and pears. My worst lunch was a pie from a petrol station on a badly organised day and my favourite was carrot soup from Animal Orchestra in Carlton. Above is the Bean and carrot salad which came from 101 Cookbooks. I liked it but I didn't love it. I made some changes. I halved the sweetner (honey) which was a good thing. I used too many sunflower seeds and I think walnuts would be better. Most of all, I think it would be great to try the salad with fresh dill as Heidi did. Also the buckwheat was too dry on its own with the salad but was great when it soaked up the tomato sauce of my mum's stew. The other recipe that didn't quite work for me last week was a Beetroot brownie that I adapted from Kari's Bite Sized Thoughts. I made quite a few changes and mine were more like cake. They looked nothing like Kari's fudgy brownies. I added some buckwheat flour and then read that it can dry out a baked good so I wondered if this was what happened. I also added eggs and oil. We all enjoyed it nevertheless. The besan fritatta was something that seemed simple and straightforward for a night when I am tired after work. Yet it took me longer than I thought it should. Convincing Sylvia to eat dinner takes a lot of energy. She often will not eat her broccoli until reminded, at which time she will nonchalantly stuff it in her mouth. Last week all she wanted in her mouth was a toy dummy that I bought her in a packet of doll's accessories for dolly - it had everything including a potty! I changed some of the seasonings and vegetables. I noticed that the besan mixture was slightly bitter and over-seasoned before mixing with the sweet vegies that added the balance it needed. The most stressful activity was flipping the fritatta. Never my favourite thing to do, it was even more difficult with a demanding child. The sides on my frypan made it hard to slide the fritatta back onto into the pan. It had a slight collapse but held together enough. The first night I served it with steamed broccoli and pink chia seed bread. (I used the drained liquid from tinned beetroots in juice instead of water when making the bread.) The second night I had some fresh turkish bread rolls. We served the besan frittata like a burger with chutney, mayonnaise, broccoli stalks, grated carrot, grated cheese and tomato. It was delicious but as soon as I put my hands around the burger to take a mouthful, the cry went up from Sylvia: "cuggle, mumma"! I don't remember what I did but I do know that I loved the burger. Adam and Theresa suggest eating the frittata with rice or potatoes which would make it a great gluten free and vegan meal. I had a wee taste of it when cold and would enjoy it on a picnic or as finger food. I am sending this recipe to Ricki for her Wellness Weekends and to Jacqueline for her Bookmarked Recipes. This time four years ago: Rumbledethumps: death to the red hag! If using cashews, soak them ahead of time (I did mine overnight). Heat 1 tbsp of oil on a heavy bottomed frypan. Saute celery, zucchini, capsicum and corn for about 5 minutes (or while you try and feed a distracted child). Add spring onion and garlic. Stir for about a minute. I then turned off the heat and left vegies in hot frypan until I was ready to use. While vegies are cooking, blend cashews and chia seeds with water until smooth. (My mini blender is better for this than my food processor but the cashews are still a bit grainy.) I then transferred to a bowl and mixed in the besan, nutritional yeast flakes, parsley and spices by hand (don't forget to add water if you don't use cashews and chia seeds). You could also do this in your food processor. Gently mix in fried vegetables. Heat the frypan (I used the same one) over medium low with the remaining 1 tbsp of olive oil. Pour the batter into the hot oil and use the back of a spoon to flatten into a large circle. Fry frittata for about 5 minutes or until golden brown. Flip onto a plate and slide back onto the frypan with fried side upwards. (I didn't find this as easy as it sounds.) Cook another 5 minutes until golden brown on the other side. (Adam and Theresa said to cover but I think I forgot to.) Serve hot or cold. Neither E nor myself are that keen on driving. We are both happy for someone else to take over the reigns. So it was quite a big undertaking to drive to Orange to visit my sister. We had three legs in the journey, mostly on the Hume Highway. Melbourne to Canberra (about 6-7 hours), Canberra to Orange (about 3-4 hours), Orange to Melbourne (about 9 hours). That's a lot of driving! There was not much traffic. Many stops and change of driver. Lots of country bakeries and a couple of quirky lunch stops. Travelling as a vegetarian with a toddler was a challenge that most places met with a smile. We passed by windmills, parks, paddocks of cattle, museums, tea rooms, op shops. If we had had more time, I would have stopped at many more places. As it was, I have plenty to tell you, so maybe that was as much as we could fit in on this trip. We started the trip in Melbourne on a cold wet grey morning. I was really tired after a busy time at work coupled with Sylvia's broken sleeping at night. In fact I was so tired I thought we might be lucky to get an hour down the road. We got to Benalla where we stopped so E could have a coffee. Hides Bakery had a great range of good quality food. No cheeseymite for Sylvia so she had a coffee scroll. E had a croissant. I was impressed with my savoury muffin (spring onions, spinach, cream cheese, feta) which was delicious with a generous seasoning with pepper. If it hadn't been so wet we might have stopped at the playground by the lake. If we had had more time we might have spent time at the art gallery and cafe. Instead we took our baked goods in the car and drove off without so much as a photo! Next stop was for lunch at the Submarine Cafe in Holbook. I thought there were a few other interesting tea rooms in the town but my mum had recommended it and the park by the submarine was a good place for Sylvia to have a run. The dark overbearing submarine in the middle of this inland town was a mystery to us. How did they get a submarine there and why fascinated us. We didn't have time to go to the submarine museum to get any answers. Mum had stopped at the cafe with my sister and her kids a few weeks before us and I suspect that the cafe met their needs for gluten free food better than it did my needs for vegetarian food. I was surprised at how little vegetarian options were on the menu. Sylvia had chips, E had sandwiches and I had pumpkin soup. When I checked if the stock was vegetarian they asked if I wanted cream. I said yes but it was a bit more cream than I prefer. However with such a pretty presentation, all was forgiven. This cafe was clean and welcoming in an old fashioned way. Nothing fancy except the doilies, which incidentally made a very nice hat for dolly. Our next stop was the Dog on the Tuckbox for doughnuts from Hides Bakery and a free tea for E. However as we stopped there on the way back I will write more about that below. After that we arrived at our destination in Canberra. I had packed some food for the trip. Pears, grainwave crisps, baked beans, carrot and tofu burgers, and bread rolls. Enough for dinner. I would have loved to have tried the afternoon teas at the Magistrates Tea Room but taking the time for a leisurely stop was not a luxury we could afford. I couldn't resist photographing the Boowora Hotel because it is typical of grand old country hotels in Australia. 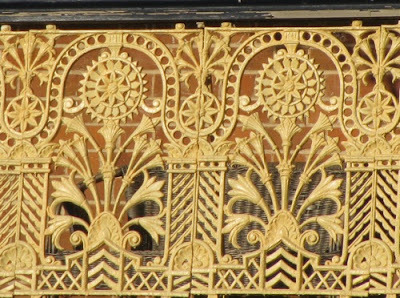 Below is the close up of the beaituful detail on the balcony that reminds me of the great title of Hal Porter's Australian classic autobiography, The Watcher on the Cast Iron Balcony. The next stop was Orange where we visited my sister and her partner. One great advantage of a road trip is having our car to drive around Orange and surroundings. A week later when we set out for home, Melbourne seemed a long long long way way. Determined to make up some time, given we had hit the road a little later than we had planned, our first few stops were at the side of the road. Lunch was at the Dog on the Tuckbox. Travelling with E who didn't grow up in Australia makes me aware that not everyone grew up singing "the dog sat on the tuckerbox 5 miles from Gundagai". But for those who did, this Aussie icon, has great nostalgic value. On the way we had enjoyed stopping here to see the statue of the dog on the tuckerbox and stretch our legs. It was a picturesque stop with rolling countryside, an wagon (see photo second from the top) and ruins. There were some signs to explain the history that gave some insight into the location. When I say lunch was at the Dog on the Tuckerbox, I mean it was opposite it at Train Stop Antiques and Cafe. When we drove off the highway, intending to go elsewhere, I saw a sign offering vegetarian meals! Inside an old train! With antiques! What is not to love about that! I was pleased upon entering the cafe to see that there were really old carriage compartments complete with the old leather seats and luggage racks. The counter area also had a pot bellied stove warming the room, a display of home bakes, lollies, jams, chutneys and souvenirs. There was a doorway into another train carriage jam-packed with antiques - crockery, pictures, books, vases, signs, toy cars, a violin and all manner of curious stuff. When chatting to the guy behind the counter he said they had only been open since February and before that the train had been empty for a few years. I hope they do well because this cafe had a good range of food for vegetarians, vegans and gluten free customers. I had better options here than in many places on our trip - dim sims, pasta bake, nachos. I chose the dim sims which were freshly fried and stuffed with cabbages and other vegetables. They were served with chips and salad of lettuce, tomato and pickled beetroot. E had a very filling burger with the lot and Sylvia had chips. It was good honest Aussie home cooked food. My meal was on the light side but really nice. We also bought some lovely ANZAC biscuits to eat in the car. Towards Albury-Wodonga E developed a thirst for a cup of tea. 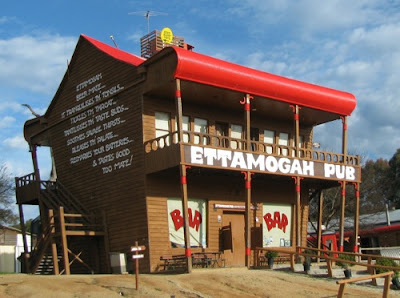 I thought he might get one at the Ettamogah Pub. This is like a Disneyland version of the traditional Aussie pub. However when were arrived there was no sign of life. It was like being on a deserted film set. The internet says it is still open so maybe they were closed between lunch and dinner. There were no clues. We left without satisfying E's thirst. It wasn't until well after we had passed the Victorian border at Albury-Wodonga that we came to the Chiltern. This is a pretty historic town that has been well preserved to reflect the heritage. Upon entering the town there was a playground where I would have loved to stop and give Sylvia a stretch if we had had more time. Instead we drove on into the main street. It was 4 o'clock by now. We went into the Chiltern Bakery. It was quiet. The chairs and tables were packed up. We didn't stop. We bought a caramel slice for me, a cute little teddy for Sylvia and a cuppa for E. The caramel slice was so good that I regretted not buying a loaf of bread to take home. It had a chewy coconut biscuit base and a good ratio of biscuit to caramel to chocolate. Best of all it wasn't ridiculously huge. I hate to sound parochial but I did find that the bakeries on the Victorian side of the border were better than those on the NSW side. Just look at those teddies! Our next stop - after a petrol station pitstop - was home sweet home. We were very tired from all the driving but it was great to have seen more of the countryside. The one place I would have liked to have stopped if we had had better timing was Glenrowan. I also wish that bakeries had more savoury snacks. After racing to get to our destination before dark (and failing) on each leg of the journey, I begin to understand the phenomenon of the grey nomad. Once you have whizzed past these places in a hurry, it gives you a thirst for time to potter about in little museums and gift shops, to linger over a cuppa tea and a CWA bake, to stop at the side of the road and photograph whatever takes your fancy. Spending more time driving around the country at your own pace has a certain charm. Yet even our own little road trip gave a greater sense of the country where we live.